When I re-found my knitty mojo in my mid twenties and picked up knitting again for the first time since I was a teenager, I threw myself in with gusto. I already knew the stitches, owned the needles and could follow patterns, so when I was in a local craft shop and saw a book of chunky knit sweater patterns that took my fancy I purchased the book then and there and picked out the sweater I was going to tackle first. So far so good. Then it came to purchasing my yarn. The book was for a branded yarn and the number of balls required would cost more than I could afford at the time. Not having a clue about guage (I’d always knitted DK/4-ply babies garments until this point which had been very forgiving) I dived straight in and began one of the patterns (which called for a chunky yarn) in an aran weight yarn that I’d found going cheap in my local market. By some complete fluke the resulting cardigan fit but that isn’t the point of course! This could have been a disaster on the scale that would make me ditch knitting as a hobby and then where would I be now?!! A couple of baby projects later I made a cardigan for myself from a Sirdar pattern which called for a DK weight yarn. I just read the DK part and substituted it with a 100% acrylic DK yarn from a local pound shop (are you getting the theme here?!) thinking DK is DK is DK right? Wrong. DK yarns can vary immensely in thickness, weight and therefore gauge. The fiber content can also have an effect on your gauge. The resulting cardigan, which was too tight to even button up, is what made me wake up and smell the coffee when it comes to gauge and yarn substitution. So what are the golden rules? There is just one. Swatch. I know it is boring and the last thing you want to do – you just want to jump straight in and begin that project, but time and experience will prevail ………. eventually, and it will only take one or maybe two completely failed projects for you to realise that an hour (or less) spent swatching at the beginning of your project will make all the difference and save you hours of time not to mention frustration later down the line. A swatch is a square of knitting using the size of needles and yarn suggested in the pattern to test your gauge (how many rows and how many stitches you get per inch) in that yarn. Most gauges are given per 4″ (10cm) square so it makes sense to cast on the number of stitches they suggest plus at least half as many again. For example, if the guage given is 22 Sts, using the size of needles the pattern specifies, cast on a minimum of 33 Sts (being the geek I am I’d go with an even number so I’d cast on 34). The bigger your swatch the truer your idea of your gauge will be. Keep knitting on these stitches, in the stitch pattern it states that the gauge is measured in. This is very important – if the gauge is for a lace pattern you will need to cast on enough Sts to cover whole repeats of the lace pattern. Similarly, if the gauge is given for Garter St – where’s the point in measuring your gauge for stocking stitch? Annoyingly, some patterns give a gauge in stotcking stitch even though there’s no stocking stitch in the pattern! I once saw a pattern for a lace dress – entirely knit in a lace pattern and the gauge was given for stocking stitch, about as useful as the proverbial chocolate teapot. Anyway, I digress, back to your swatch. Keep knitting until your swatch is roughly square shaped – this will not mean knitting the same number of rows as the number of stitches you cast on as typically there will be more rows than stitches per 10cm. When you swatch is roughly square shaped, Bind off. If a gauge is given after washing and blocking, guess what? You have to wash and block your swatch before measuring. A pattern should state if it is very important that the gauge is taken after washing and blocking. This will be particularly important for lace patterns as washing and blocking will open out the lace pattern and you can’t really get a true gauge without blocking. You should wash your swatch according to the care instructions on your yarn band. Don’t give it any more special treatment than you will with your finished garment. If there’s not a chance in hell that you are going to hand wash your finished garment in specialist detergent then don’t bother doing it with your swatch! How do I measure my Gauge? Now you have your (washed and blocked if required) swatch. Lie it on a flat surface (no, you won’t get an accurate measurement from your lap). Take a ruler – real knitting geeks will even rule out using tape measures as over time they can stretch and give inaccurate measurements. Lie your ruler horizontally on the center of your swatch – near the middle where your knitting will have been at its most relaxed and count along how many stitches you have per 4″. Do the same with the rows – lie your ruler vertically near the center of the swatch and count how many rows you have per 4″. What should I do if my gauge is off? If you have more stitches and rows than stated for the gauge in the pattern, you need to use larger needles. If you have less stitches and rows than stated for the gauge in the pattern, you need to use smaller needles. Really, at this point, if your gauge was off, you should swatch again with either larger or smaller needles. What if my stitch gauge is fine but my row gauge is off? This is quite rare – usually if one is out they both will be out but if there is a large discrepancy then you can add in/take out rows of the pattern as required. In patterns which have instructions like: Cont. in St St until piece measures 7″ – this is straightforward to do – but you will need to bear in mind that if your row gauge came out higher than the pattern stated you will need more yarn as you will be knitting more rows per inch which eats up more yarn. Let’s say the pattern calls for a gauge of 32 rows per 4″ and you have 36 rows per 4″ (but your stitch gauge is spot on) then you need to understand that basically, the pattern wants you to start your armhole decreasing after 8/32 = 1/4 of 4″ which is 1″. Whoa……. slow down with the math………what was that in plain English? The pattern wants you to knit for 8 rows. But that means nothing without knowing what the gauge of the patern is – in this case 32 rows. So dividing the number of rows required (in this example, 8) by the number of rows per 4″ in the required gauge (in this example, 32) gives us 1/4 (or 0.25 for those more used to decimals). In other words, the pattern wants you to knit for 1/4 of 4″ before starting to decrease for the armholes. More simply put, 1/4 of 4″ is 1″. So, in English, the pattern wants you to knit for 1″ before beginning to decrease for the armholes. Now we need to work out how many rows that is with your gauge (or you could just have your tape measure handy and keep knitting until the required section measures 1″) but if you’ve got this far with the math let’s finish the job properly…. Your gauge is 36 rows per 4″ and we have now established that the pattern wants you to knit for 1″ (1/4 of 4″) before decreasing for the armholes. So we need to work out what 1/4 of 36 rows is – which is easy – you just have to divide 36 by 4: which gives you 9. So you need to work 9 rows before beginning your armhole decreases. What if this leaves me on the wrong side of my work for the next part of the pattern? – knit one more or one less row – I’m always inclined to round-up rather than down with my knitting as I’d rather something was a fraction too big than too small but this is down to your personal preference. The same goes for if your math doesn’t give you nice whole numbers like in the example above. If your row gauge had been 37 for example rather than 36 in the above example, this would have required you to knit 37 ÷ 4 = 9.25 rows before decreasing for the armholes. I would have rounded that down to 9 rows. What if my row gauge is fine but my stitch gauge is off? Now you know what to do if your stitch gauge is fine but your row gauge is off but what if your row gauge is spot on but your stitch gauge (measuring horizontally around your body) is off? Firstly, try swatching on a different size needle. If you have more stitches than the gauge calls for – try swatching on larger needles, if you have less stitches than the gauge in the pattern calls for – try swatching with smaller needles. It is easier to alter the row gauge as described in the above section than to alter your stitch gauge. Essentially, getting the fit on your bust/waist/hips is more difficult to alter than altering the length of the garment. Let’s say the pattern calls for a stitch gauge of 24 Sts and 32 rows but try as you might, you always get 26 Sts and 32 rows. If you carried on and knit the garment to this gauge your garment would turn out too small. In fact, specifically it would be about 10% too small – how do I know this? 24 ÷ 26 = 0.92 x 100% = 9%. In English that is 24 (the number of stitches the pattern gauge requires you to have) divided by 26 (the number of stitches you have) multiplied by 100% to give us a percentage. 10% is a significant difference. 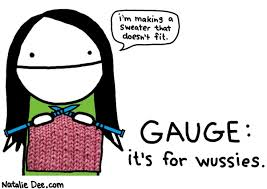 If you were knitting a cardigan which, when finished, should measure 34″ across the bust, the garment you will be left with if you ignored your gauge would be 34″ ÷ 10 = 3.4″ smaller, a 30.6″ bust rather than the 34″ you wanted. And there you were thinking those 2 little stitches wouldn’t make any difference! Never fear, here’s the math to help you. We have established that your gauge is 9.3% smaller than called for. This means that the number of stitches needs to be increased by 9.3% all around. At every point in the pattern where number of stitches are mentioned you need to add on 9.3% of stitches – actually, shall we just work with 10% to make this easier? So, let’s say the pattern calls for you to cast on 96 Sts. You will need to cast on 96 + 9.6 Sts = 105.6 sts – we’ll call it 106. Wherever the pattern refers to stitch counts from here on you need to remember to add on 10% – you might find it easier to sit down and read through your pattern with a calculator handy, adding in your new stitch counts before you begin knitting. Don’t forget that you will now have more stitches to decrease and/or increase wherever these are called for. As your row count is spot on and doesn’t need altering, this can cause headaches when decreases take place over a number of rows. For example, let’s say the pattern tells you to decrease 1 St each end of next 10 rows. This is 20 sts in total. For your size you need to decrease 10% more stitches so you need to decrease 22 Sts. Where oh where are you going to get rid of those 2 extra stitches? you have two choices. On the first row of decreases you can do a double decrease (SK2P, S2KP, p3tog or k3tog) at each end of the row or you can leave those 2 extra Sts where they are and add them to the extra number of Sts to be decreased at the next point in the pattern which calls for decreases on alternate rows or further apart or add them to the number of stitches to be bound off at the next point in the pattern calling for stitches to be bound off. Simply put – always, always swatch and try to get into good habits as soon as you take up knitting as a hobby and get used to swatching for every project. It doesn’t matter what the result is, so be honest with your swatch – it’s only you who is going to lose out in the end by kidding yourself that your gauge is spot on if it isn’t – you saw above the perils of turning a blind eye to even the smallest number of stitches your gauge is out by………. Hopefully I’ve shed a bit of light on gauge and how to adapt patterns to deal with discrepancies in your gauge and have more success substituting yarn. However, there are limits to yarn substitution – you’re still going to have a headache if you insist on knitting a chunky gauge sweater in laceweight yarn! Previous Post Are you a Yarn Snob?